I hope you have been enjoying all of the great learning activities in Playful Preschool. It has been fun to join in with a great group of blogger educators to bring you activities each week related to a new theme. In case you missed any of our contributions, we shared a Family Footprints Craft for the family theme, While At The Farm Children’s Song for the Farm theme, Corny Science Experiment for the Harvest theme and How To Make Your Own Fall Colors Potpourri for the Fall Colors theme. Now, it is on to our next theme which is Nighttime. We have talked a lot about nocturnal animals and the Sugar Snaps can all proudly name at least three. They understand that nocturnal animals are active at nighttime and sleep during the daytime. I decided to expand their ‘nocturnal knowledge’ by adding an insect. 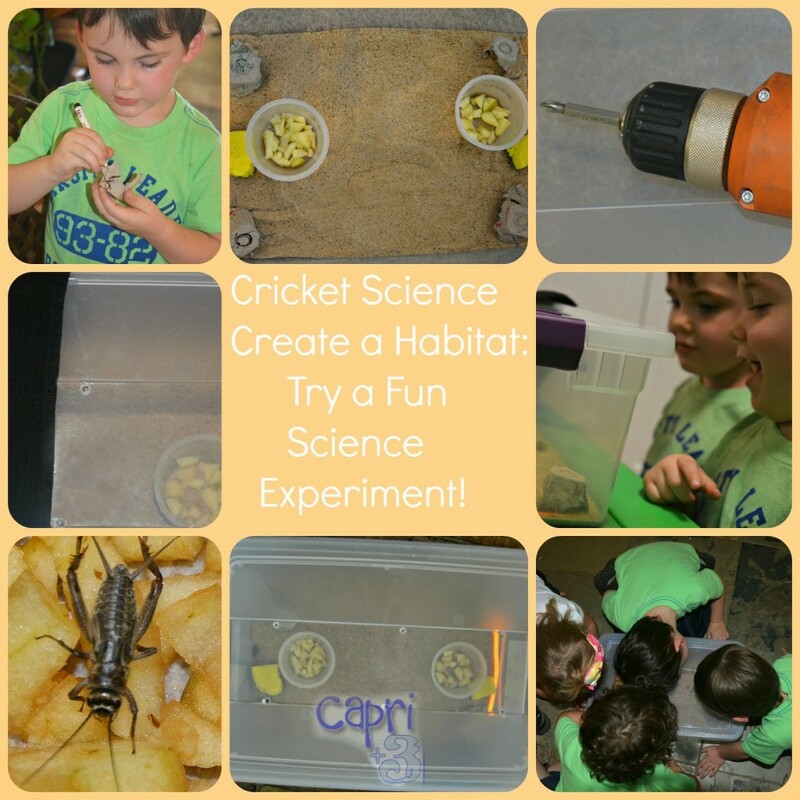 We had a great time making a cricket habitat and doing a simple science experiment with the crickets. Cut up an egg carton so that you have little huts for the crickets. We made four (with one egg cup each). Make sure that the arch of the hut is large enough so that children can peer in to see the crickets. If desired, have your children or students decorate the huts with crayons or markers. Poke several holes in the plastic box lid. I found it easiest to do this when the lid was secured on top of the box. The look on the Sugar Snaps’ faces showed that I had a new ‘cool factor’ when I used a power drill to make holes in the lid. They were fascinated seeing me use a power tool! You could also use a hammer and nail or a screwdriver to make the holes. Either way, this is an adult task. Next, add sand to the bottom of the box. Children can help with this task by helping to tip a bag of sand or filling measuring cups with sand and dumping them in. Cut a couple of pieces off of a sponge and wet them with water. Squeeze them out so that they are damp, not soaked. Too much water can be harmful to crickets. Putting in a bowl of water is not recommended. Have your children or students place one moistened sponge piece on each side of the box. 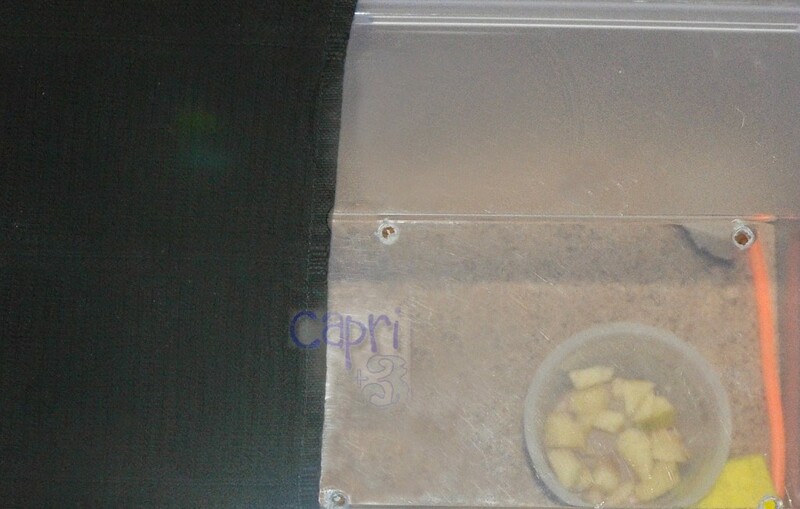 Then, prepare food for the crickets by dicing up an apple (or you can use another suitable food such as fish food). Crickets would also enjoy some chopped citrus peels. 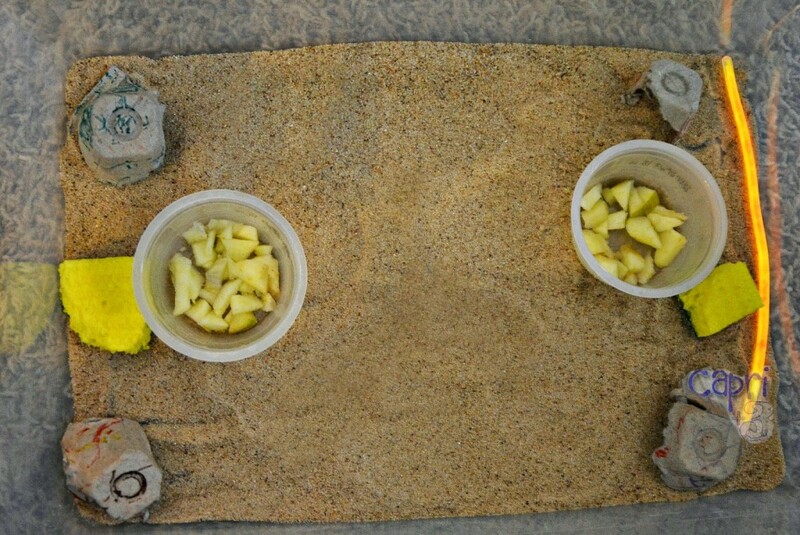 Either way, prepare two small containers of food with equal amounts and place one on each side of the habitat. Place an equal number of huts on each side of the habitat with the arches facing out so that everyone can see inside. 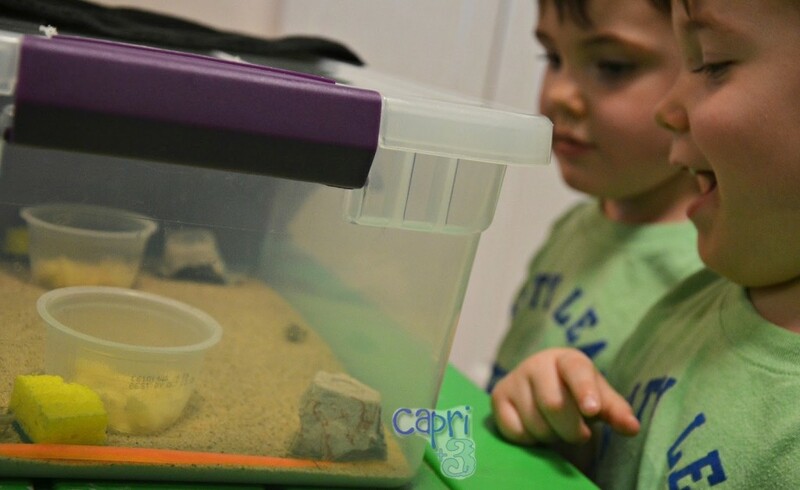 Before you add the crickets to the habitat, discuss what you will be doing with your children or students. First, you will place a glow stick on one side but not the other. How do they think the crickets will react? Next, you will make one half dark with a piece of fabric. The other side will be in the lit room with an activated glow stick. What are their predictions about the crickets behavior? Activate the glow stick and place it on one side of the habitat. Add the crickets and close the lid. 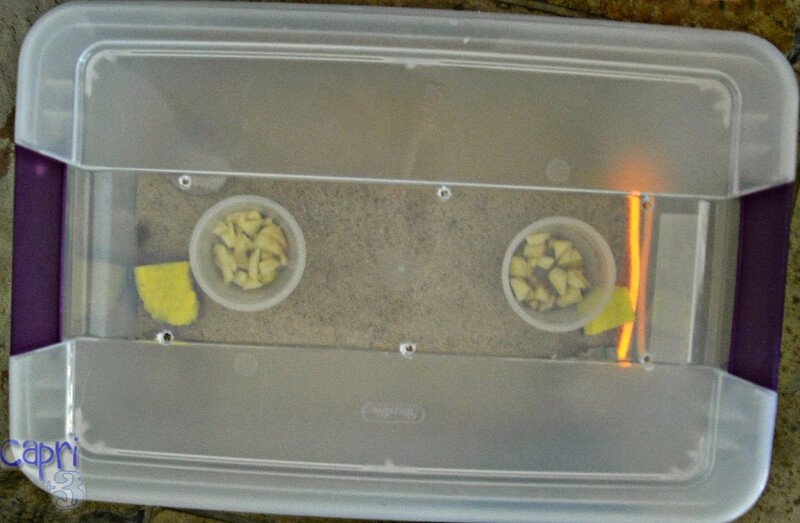 Have your children or students observe the crickets to see if they prefer the side with or without the glow stick. Observe how they react to the glow stick. Do they crawl on it? Do they scamper away? Do they avoid it? Next, cover one half of the box with dark fabric to block out the light. Have the your children or students observe the crickets and count how many they can find in the open on the lit side of the habitat. How many did they observe going into the huts on the lit side? Have them do a math problem to figure out how many crickets are on the lit side and how many are in the darker side. Talk about the nocturnal nature of crickets and how the darker side of the habitat simulates a nighttime environment. If possible, darken the room, or observe the crickets at night in a darkened room. Can they hear them chirp? The clerk at the local pet supplies store courteously gave us crickets without wings so they would not fly out when we opened the box. Ours were very quiet. Discuss how crickets make the chirping sound by rubbing their forewings together. Have the children make chirping sounds by pretending to rub their imaginary wings together. 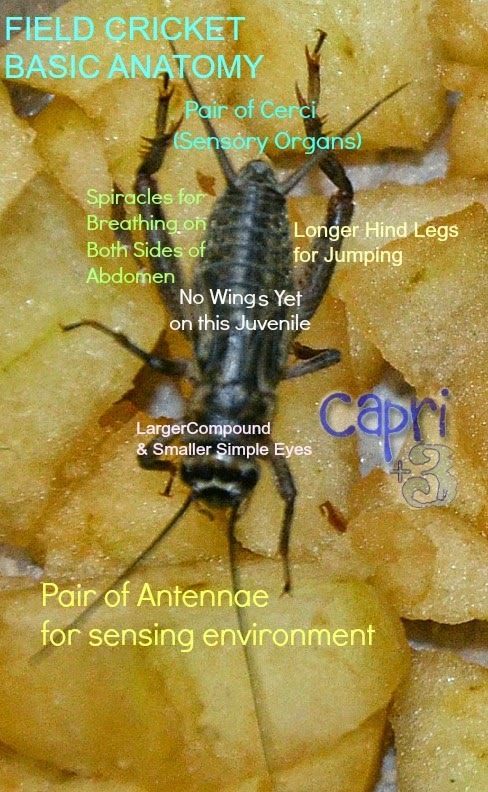 I labeled a photo of one of our crickets to show them the very basic anatomy of a cricket. It was fun to see their excitement learning about crickets. If you would like to teach the Playful Preschool nighttime unit to your children or students be sure to read and pin the rest of the posts in the series. Follow the hasthtag #playfulpreschool so you can easily find all the Playful Preschool posts. 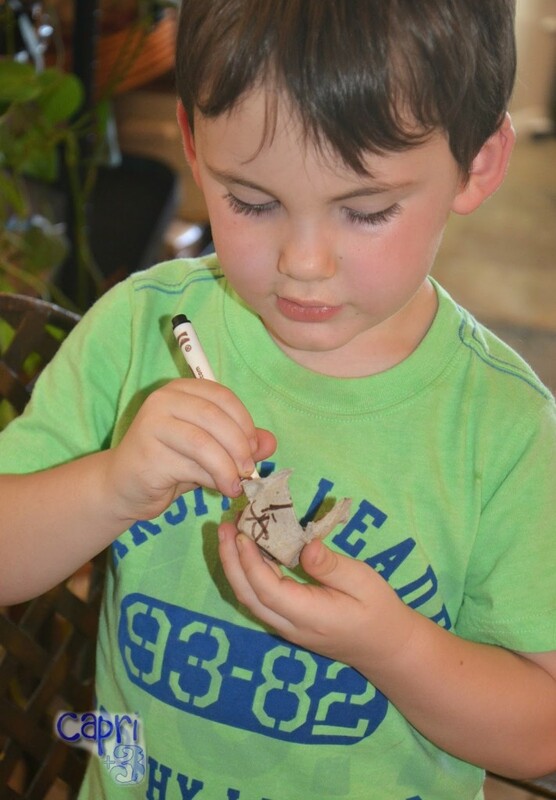 Book-Inspired Preschool Owl Craft at Fun-A-Day! Join us tonight for a live Google + Hangout at 9:00 PM EST. We will discuss Night Activities for Preschoolers. NO worries if the time doesn’t work for you, it will be recorded and available to watch afterwards. Ooh, this is a great idea for a pet. Any thoughts on how long they will live? We have raised caterpillars- but never crickets! Unfortunately, they live only about 8-10 weeks. But a female can lay up to 200 eggs! We plan to release ours into a field to that they can enjoy some freedom and our little ones will not need to experience the loss. We had a lot of fun with it. It was even fun for me to watch the crickets and see what they did with the two sides of the environment. I hope Daddy can give it a try. It really is a lot of fun. This is pretty cool. I gotta remember to do this when my little one is big enough. It is a lot of fun. I hope you get the chance to try it some day. Great! I am excited to hear that you are going to try it out. If you get the chance, come back and let me know how it goes. Yes, I imagine your boys would love it and you would get an added cool factor for bringing home insects! They would never have to know that they scared you a little ; 0 ). What a fun experiment! I know my daughter would love this! We'll have to try it out when my son is a little older so he can participate too. Thanks for sharing!! Thank you. I hope you get the chance to try it out. Your son will be glad you waited for him. He won't want to miss this! How fun! My son would LOVE this so much! I hope you son gets a chance to experience it. Ours enjoy the crickets, long after the experiment is done. Naimah would love this! We will have to give it a try! I hope Naimah has a great time trying it out. It is fun to watch what the crickets do. This is a great hands-on play idea! We just finished reading The Cricket in Times Square so I'm sure my son would love this. You could always do a science experiment with something furry and cute like a hamster. Kids could see what kind of food the hamster likes best. Hello Growing Book by Book. We will have to check out the Cricket in Times Square. That would be a great addition to this project. Thanks for the suggestion. This is a really nice project for them. I like the little huts for the crickets. This is such a fun habitat for learning! I'll bet the kids had a blast creating and observing!! They had a lot of fun decorating the cricket huts. The crickets really use them too. It makes a perfect shelter. They did have a blast. It was fun for them to make the habitat and then watch the crickets enjoying their new space. I enjoyed seeing them develop a hypothesis based on the knowledge that the crickets are nocturnal and then observe to see if it came true. Such an educational and fun project to do together! 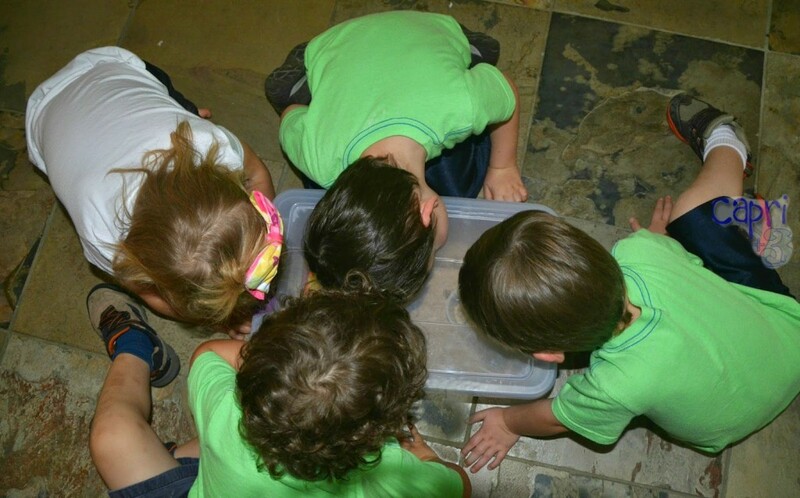 This is such an awesome experiment for the kids! I've never tried raising crickets or even observing them. So fun and educational! It was a lot of fun. It was nice to see them excited to learn about crickets. This was a new experience for me too. I think part of the fun of being a parent is experiencing things with my children and seeing the excitement through their eyes. How fun! One of my daughters loves catching crickets each summer, but we've never done a full habitat. This looks so cool! Perhaps she can make the crickets a habitat next summer. It is a lot of fun and easy too. We took the easy route and 'caught' ours at the pet store! This looks like a great science project for my bug lovers. Thanks so much for this post. Fantastic activity – my kids would love this. We've raised caterpillars, frog spawn and snails at home but never crickets/grass hoppers. Also find it very interesting that in the US they are nocturnal animals whereas in the UK they are diurnal. I hope your bug lovers get a chance to try this out with crickets or another insect. That is an interesting observation about crickets. I have never heard a cricket before dark here. Your kids have had the chance to do so many fun projects! I think they would enjoy this one too.